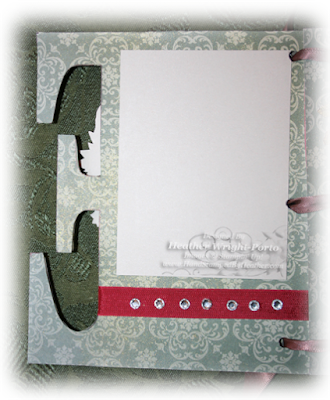 In following the previous post, here are two more pages of the beautiful B-E-L-I-E-V-E Chipboard album project. 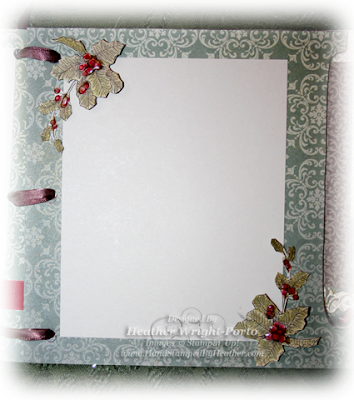 The pages below are the back of the letter "E" and the front side of the letter "L" decorated with the green, vintage patterned paper from the DECK THE HALLS Designer Series Paper. This is the back side of the previously shown letter "E" with the Cherry Cobbler Seam Binding Ribbon tied in a bow. On this side, notice it is decorated with the new Rhinestone Jewels from Stampin' Up! There is also a 3 x 3-3/4 piece of Sahara Sand cardstock, a photo mat. On this facing page, it is the front side of the "L" and again a photo mat is place (Sahara Sand). It is 3-3/4 x 5 inches. Each corner is then decorated with the holly. The BELLS AND BOUGHS stamp set is use and again featured throughout this project. The holly was stamped on Sahara Sand paper in Early Espresso. then the leaves outlined using the Always Artichoke Stampin' Write Marker and then colored with Old Olive Classic Ink (with Blender Pen). The berries were colored (using the Blender Pen) with Cherry Cobbler Classic Ink Pad. Then Crystal Effects was placed over each set of berries. More to come in two days...every two days another set of pages will be featured. Then the main, first post will be updated with links to all the pages.